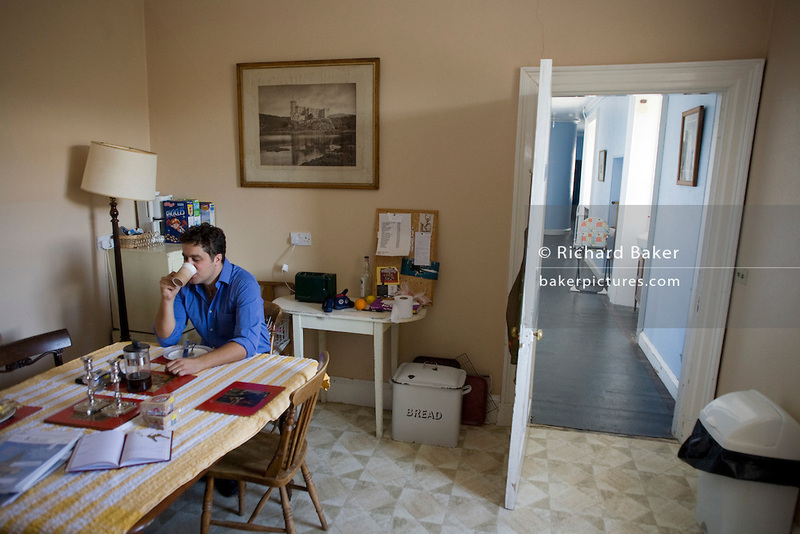 30th Chief of the ancient clan MacLeod, Hugh MacLeod, 34, eats a hasty Saturday breakfast in his private flat at Dunvegan Castle, Maureen Byers on the north-west corner of the Isle of Skye, Scottish Highlands. Dunvegan has been the clan's traditional stronghold and ancestral home for 800 years which makes it the longest inhabited family home in Scotland. Now a visitor centre and place of pilgrimage for MacLeods from all over the world, it houses medieval artefacts from when Scotland was a wild and warring nation against the English. It has survived clan battles, extremes of feast and famine and profound social, political and economic changes in the Highlands. Originally designed to keep people out, Dunvegan Castle was first opened to the public in 1933. Visitors include Sir Walter Scott, Dr Johnson, Queen Elizabeth II and Emperor Akihito.